According to Jim Meyer, there are numerous pictures from the gatherings over the years, but this one is special. "It says a lot about brotherhood," he says. 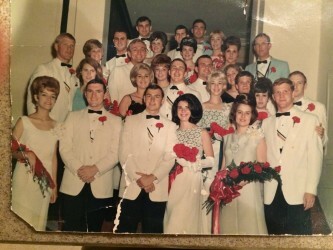 Gerry Widegren, seated, was in a terrible car accident during spring break in 1966. Three Sigma Nus were killed and Gerry was seriously injured. He has mobility issues now, but the group involves him in as many events as they can. 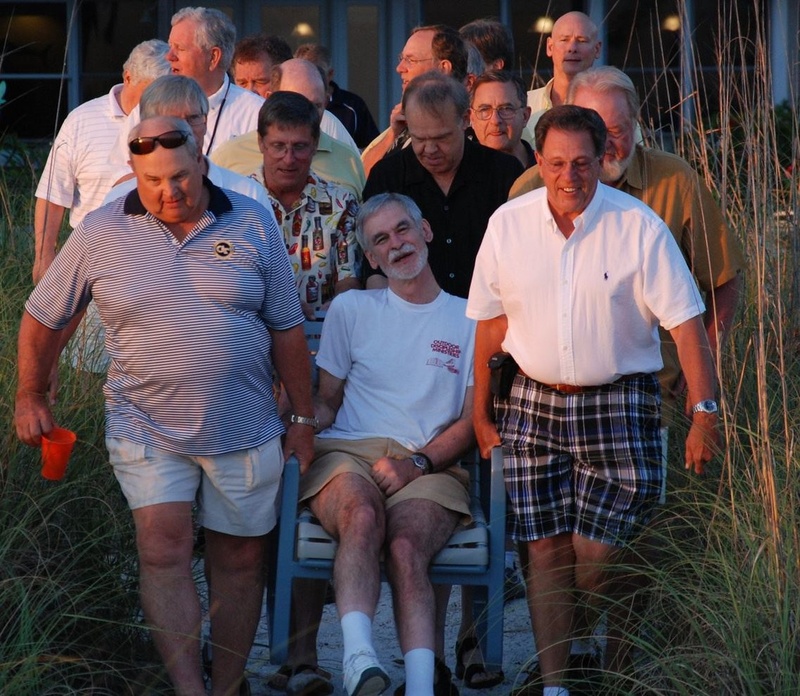 "This is a picture of us taking Gerry to the beach for a group photo at sunset," said Jim. "Gerry is my brother, as are all the guys." Fraternity life was big in the sixties at Georgia Tech, and it was easy for the '64 Sigma Nu pledge class to bond during the years they spent together in the old house at 750 Fowler Street. They got close in those four years of walking up the hill to class. It was even easy to stay close for a few years after graduation – standing up in each other’s weddings and meeting at homecoming – but then life started to get in the way. Brothers started to have families and relocate, and keeping in touch got harder and harder. They wanted to get together, but a reunion never happened. Then life intervened, again. Two brothers, George Fauerbach and Ross Miller, from the '64 pledge class died in late 2003, and early 2004, and a group of four brothers – Dave Bassett, John Thigpen, Fred Link and J Meyer – decided to seize the day and start the Gathering of Old Snakes. They settled on a beach house reminiscent of a big fraternity house on Anna Maria Island, just west of Bradenton, Fla. and picked a weekend to meet the following spring. Another Sigma Nu brother, Jack Painter, joined them when the date rolled around. J Meyer remembers that he hadn't seen Jack since the '70s. He added to a great weekend filled with old memories, old jokes and catching up on life over dinner and drinks. It was a great weekend and they all agreed to do it again. Six weeks later, in June of 2004, Jack Painter died of a heart attack. That was when the group of friends knew that they had to make the Gathering of Old Snakes an annual event. 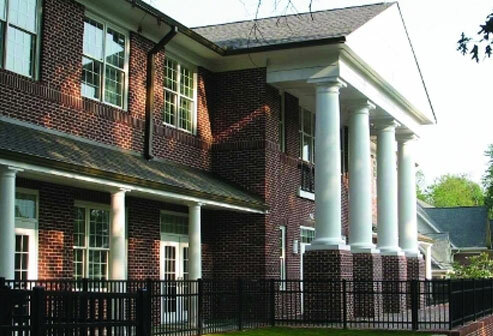 They opened it up to brothers who lived in the house when they were at Gamma Alpha, from those who had been seniors when they pledged to the new class that joined the year they graduated. Twelve brothers met at the beach house the next year, and it grew to 25-30 every year since then. Some brothers can make it every year, some come every other year. He and Dave Bassett run the event with a combination of free time and scheduled events, which include volunteer work in the local community. 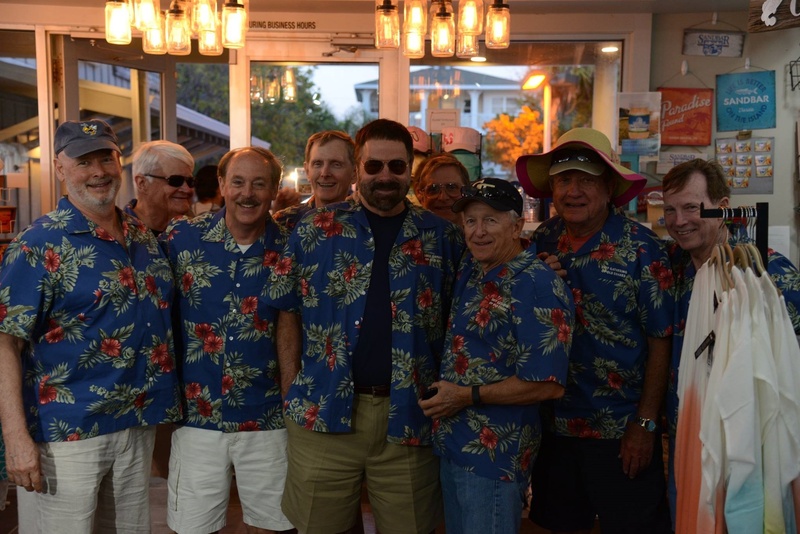 Every year the brothers join for a group photo in their matching shirts (which are embroidered with the year and 'Gathering of Old Snakes'), and the pictures on their Facebook page, Sigma Nu Gathering, look like a continuation of their pledge class photos back at the house on Fowler Street … brothers living life together and having a great time doing it. But it's this snapshot, taken before the official group photo, that is priceless. The brothers gather around Gerry Widegren, taking him to the beach for the group photo on the beach at sunset. Gerry was in a car accident with three other Sigma Nus during spring break 1966. They were killed, and Gerry was severely injured. Then, as now, his brothers gather around him. In the split second that the photo was taken, you can see grins, stories, hard work... the strength of a brotherhood. It's true fraternity in a single frame. A group of Old Snakes at this year’s gathering. Click here to learn more about the Gathering of Old Snakes.